A new report published today by SPERI finds that the salience of the concept of ‘savings’ in British political discourse appears to have declined. In this new SPERI British Political Econony Brief, Craig Berry explores how savers and the saving process have been discussed in the election manifestos of the Conservative Party and the Labour Party since 2005, up to the most recent election in June 2017. Noting recent shifts, the Brief considers whether the era of ‘asset-based welfare’ in British statecraft is coming to an end. It is telling that both parties were in government rather than opposition at the time, insofar as this suggests that ‘asset-based welfare’ is an endemic feature of British economic statecraft, irrespective of which party is in government, and irrespective of what parties say while in opposition. But the 2017 general election appears to have signalled a significant shift. Whereas Ed Miliband’s 2015 agenda can now be seen as an important ‘gateway’ between New Labour and Corbynism, the shift in Conservative discourse has been more abrupt. However, we should be careful before declaring the onset of a new era in economic statecraft around saving; neither party won a majority at the 2017 election. It is possible that both parties – particularly the Conservatives – will revive a positive discourse around saving in order to reassemble a compelling electoral offer. Asset-based welfare is down, but not necessarily out. The full publication can be downloaded here. 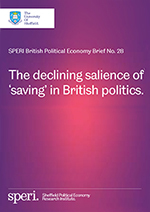 Through its series of British Political Economy Briefs, SPERI hopes to draw upon the expertise of its academic researchers to influence the debate in the UK on sustainable economic recovery.